“Freeheld” is first and foremost a love story beautifully portrayed by Julianne Moore and Ellen Page. The former plays Laurel Hester, an in the closet police officer for 23 years who meets and falls in love with the latter who plays the much younger Stacie Andree. After being diagnosed with stage 4 cancer Laurel wants to fight for equality so that when she does die Stacie would get her pension as the surviving spouse in a heterosexual marriage would, and Stacie would be able to keep the house the house and home they have made together. 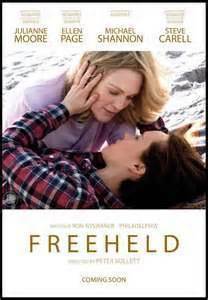 “Freeheld” is based on the Oscar winning 2007 documentary and in ways ‘Hollywoodizes’ it but the core romance between the two women is always there. While Laurel isn’t a gay activist and comes out for the equality and justice that made her a first rate police officer on her way to becoming a lieutenant, Steven Goldstein (Steve Carell) a self described ‘loud, Gay, Jew from New Jersey’ sees this as a chance to fight for gay marriage. Dane Wells (Michael Shannon), as Laurel’s partner on the police force for many years, is at first annoyed that she had kept this secret from him but quickly ‘covers her back’ as a good partner always does on the force and joins the couple in their fight. He, in a way, represents the non-gay audience while Goldstein is pretty much of a stereotype as a gay activist though the two men have a couple of very funny exchanges. We meet Laurel’s sister (Kelly Deadmon) and Stacie’s mother (Mary Birdsong) who seem to accept their relationship, and fight, without any qualms just as the sister accepts the fact that her sibling will die. In either case it would have been better if the screenplay by Ron Nyswaner had spent a little more time with that instead of representing all different views of why Stacie should or should not get the pension from preserving ‘the sanctity of marriage’ to ‘what does the bible say about homosexuality--that’s right--nothing’. Along the way there is Todd Belkin (played by Luke Grimes) an in the closet cop along with the homophobic cops, the righteous Ocean County Board of Chosen Freeholders along with the one, played by Josh Charles, who doesn’t feel their voting against it is the right thing to do. The direction by Peter Sollett is straight forward and though he should have spent less time on the political side and more on the Laurel and Stacie relationship the actresses bring your feelings, and tears, to the screen without being manipulated. Both deserve to be nominated for awards but though Moore brings a different take to a sick person than she played in her Oscar winning role in “Still Alice” she may not be recognized for the beauty of her performance as Laurel. Behind the politics it is the love story of the two women that made the former possible and that aspect of the movie is handled naturally. “Freeheld” is a must see movie for those who like a good love story, for those who are into politics and, yes, those who profess they believe in equality and the steps it takes to have it.